We use only traditional methods, materials and lime mortars. We understand the importance of historic buildings and are very sympathetic when repairing/restoring any building. We understand that incorrect use of materials and/or approach can dramatically alter the character of any historical structure. We often work closely with conservation officers and local authorities when work is carried out within conservation areas. We carry out a wide spectrum of projects ranging from small privately owned properties to listed buildings, churches, National Trust properties and large country estates throughout the Home Counties and London. Mathias has acquired the new sector specific Heritage Skills NVQ level 3 which demonstrates and proves competency to work on historic buildings. 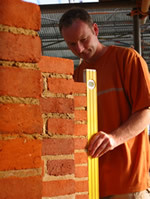 We are craftsmen in all aspects of brickwork and specialise in Tuck Pointing, Gauged Brickwork, Pointing, Flintwork, and Lime mortars.